This miniature replica shows three prisoners of war caring heavy loads of rocks in a quarry with many armed guards above. The limestone relief is from the Palace of Sennacherib, king of Assyria at Nineveh his capital. It is from the seventh century BC. The original is located at the British Museum. - Alabaster relief from the SW palace of Sennacherib at Nineveh, his capital. 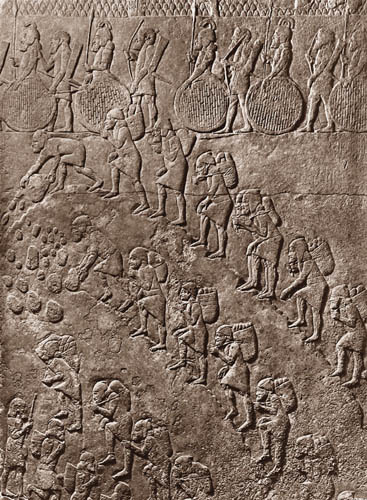 - Slaves and in a quarry (possibly Hebrew) carrying heavy stones. - God promised Israel if they followed idols he would remove them from the land. - The captives are barefoot, wearing short skirted garments. - The soldiers alternate between spear carriers with shields and archers. - The lozenged background above shows that they were under ground level. - The detailed relief stands 254 cm (8.3 feet) tall. 2 Kings 17:14-17 - "Notwithstanding they would not hear, but hardened their necks, like to the neck of their fathers, that did not believe in the LORD their God. And they rejected his statutes, and his covenant that he made with their fathers, and his testimonies which he testified against them; and they followed vanity, and became vain, and went after the heathen that [were] round about them, [concerning] whom the LORD had charged them, that they should not do like them. And they left all the commandments of the LORD their God, and made them molten images, [even] two calves, and made a grove, and worshipped all the host of heaven, and served Baal. And they caused their sons and their daughters to pass through the fire, and used divination and enchantments, and sold themselves to do evil in the sight of the LORD, to provoke him to anger. Therefore the LORD was very angry with Israel, and removed them out of his sight." This panel is one of a series that originally decorated two sides of a courtyard at the palace of King Sennacherib (reigned 704-681 BC). Instead of the usual scenes of warfare, they show the transport of a winged bull from quarry to palace, part of Sennacherib's construction work. Sennacherib was very proud of his buildings and describes the palace as one 'without rival'. The king himself is shown on the left, personally supervising the work. The human-headed winged bull, known as a lamassu, will eventually stand as a guardian figure at an entrance to the palace. The figure has been roughed out in the quarry, and is being dragged across country on a sledge. Gangs of prisoners pull at the front, while another group insert a huge lever under the curved back of the sledge, and secure the lever with a wedge. They then swing on the lever in order to raise the back. Rollers are then placed underneath. The whole operation was directed by men with trumpets. They stand, not very helpfully, adding their weight to the load on the sledge! At the bottom a man is using a shaduf, a kind of water-sweep still used in parts of the Middle East. Here, the water-course is being diverted so that the bull can pass without being bogged down. The operation continues in another panel from the series. Note: There is another part of this stone panel at the British Museum that reads: The movement of a stone sculpture from the quarries. This panel continues the narrative from the previous panel in the series that originally decorated two sides of a courtyard at King Sennacherib's palace. 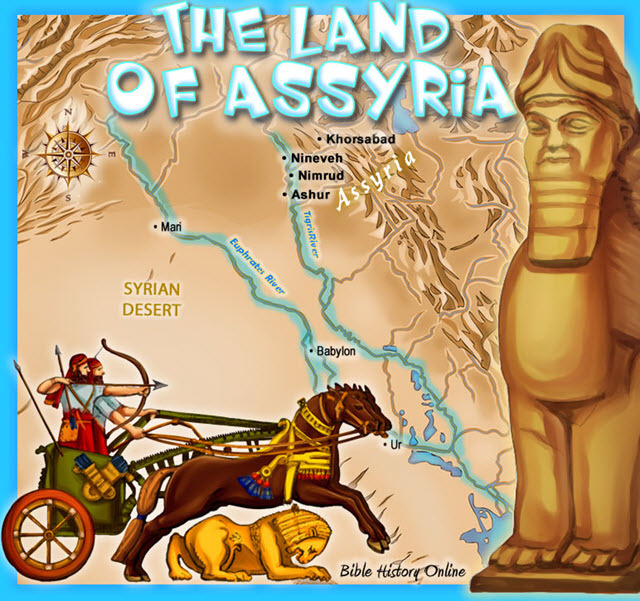 Instead of the usual scenes of warfare, they show the transport of a human-headed winged bull, or lamassu, part of Sennacherib's construction work. Here, the lamassu is being levered forward, hauled on its way to Nineveh. Written documents show that Sennacherib took a close interest in the progress of building and decoration; he proudly describes the palace as one 'without rival'. He also made use of senior officials including experts in magic who knew how to position magical guardian figures for maximum protection. Sennacherib planned to transform the ancient city of Nineveh into a place that would astonish the civilized world. A system of canals and stone aqueducts brought water from forty or fifty miles to the parks, orchards and allotments of the city. 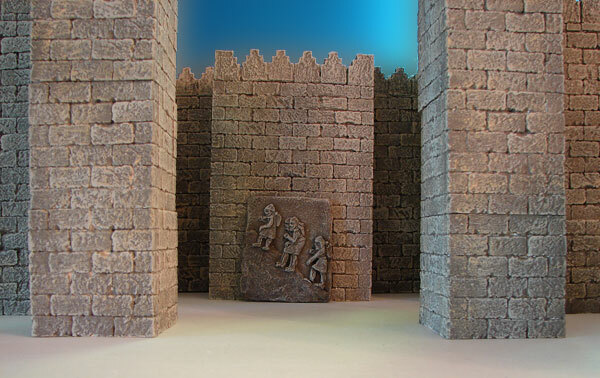 This relief helps us to reconstruct ancient quarrying and building techniques. 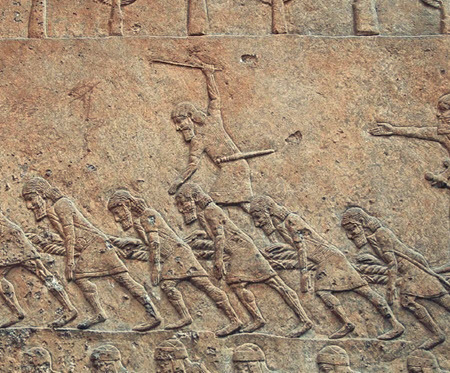 The stone was cut with great iron saws, which can be seen being carried by some of the workers on the relief. Examples of such saws have been excavated at Nimrud. The colossal figures (weighing up to sixteen tons) were roughed out to reduce their weight, but the final carving was done after it was set in position, as was done with the carved relief panels.